Kick off your visit on the 31st (Fri): kick back and relax at Limantour Beach, then look for gifts at Cornerstone Sonoma, and then learn about winemaking at Jacuzzi Family Vineyards. Get ready for a full day of sightseeing on the 1st (Sat): get great views at Vista Point, then admire all the interesting features of Marin French Cheese Company, and then look for all kinds of wild species at Tule Elk Preserve. To see reviews, maps, photos, and tourist information, use the San Francisco vacation website . Perth, Australia to San Francisco is an approximately 25-hour flight. The time zone difference when traveling from Perth to San Francisco is minus 16 hours. Traveling from Perth in July, things will get a bit warmer in San Francisco: highs are around 26°C and lows about 16°C. Wrap up your sightseeing on the 2nd (Sun) to allow time to travel to Las Vegas. On the 2nd (Sun), get some thrills out on the water with a waterskiing or jet-skiing adventure. Get ready for a full day of sightseeing on the next day: get your game on at Dig This, then try your luck at Casino at the Venetian, then browse the different shops at The Forum Shops at Caesars, and finally let your taste buds guide you at a local gastronomic tour. For reviews, ratings, photos, and other tourist information, use the Las Vegas route maker . You can fly from San Francisco to Las Vegas in 4 hours. Alternatively, you can drive. When traveling from San Francisco in August, plan for much hotter days in Las Vegas, with highs around 45°C, while nights are a bit warmer with lows around 29°C. Wrap up your sightseeing on the 4th (Tue) early enough to travel to Grand Canyon National Park. 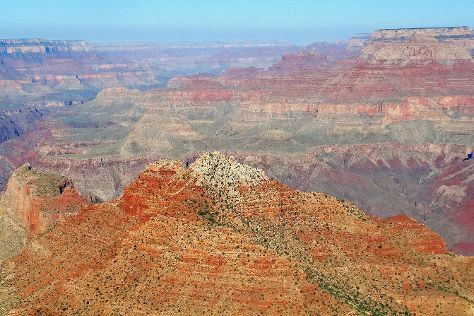 Start off your visit on the 4th (Tue): take in breathtaking views at Yavapai Point, then cruise along East Rim Drive, then get great views at Maricopa Point, and finally trek along Hermit Trail. Get ready for a full day of sightseeing on the 5th (Wed): take some stellar pictures from Yaki Point, then take some stellar pictures from Lipan Point, then get great views at Navajo Point, and finally make a trip to Powell Point. To find photos and other tourist information, read Grand Canyon National Park road trip planning tool . You can do a combination of car and flight from Las Vegas to Grand Canyon National Park in 4.5 hours. Alternatively, you can drive; or take a shuttle. You'll lose 1 hour traveling from Las Vegas to Grand Canyon National Park due to the time zone difference. In August, Grand Canyon National Park is colder than Las Vegas - with highs of 31°C and lows of 11°C. Finish your sightseeing early on the 6th (Thu) to allow enough time to travel to Las Vegas. Start off your visit on the 6th (Thu): try your luck at Wynn Las Vegas, then buy something for everyone on your list at The Grand Canal Shoppes at The Venetian, then relax and float downstream with a rafting and tubing tour, and finally enjoy some diversion at The Range 702. Get ready for a full day of sightseeing on the next day: examine the collection at Counts Kustoms, make a trip to Chapel of the Flowers, enjoy some diversion at Strip Gun Club, then engage your brain at Bodies The Exhibition, then try to win big at Casino at Luxor Las Vegas, and finally stop by M&M'S World Las Vegas. For photos, reviews, where to stay, and other tourist information, read our Las Vegas trip itinerary builder . Traveling by combination of flight and car from Grand Canyon National Park to Las Vegas takes 4.5 hours. Alternatively, you can drive; or take a shuttle. Due to the time zone difference, you'll gain 1 hour traveling from Grand Canyon National Park to Las Vegas. Expect warmer temperatures when traveling from Grand Canyon National Park in August; daily highs in Las Vegas reach 45°C and lows reach 29°C. Wrap up your sightseeing on the 7th (Fri) early enough to travel to Oklahoma City. Discover out-of-the-way places like Stafford Air & Space Museum and Chickasaw Bricktown Ballpark. Explore Oklahoma City's surroundings by going to Marland Estate (in Ponca City), Fred Jones Jr. Museum of Art (in Norman) and Tulsa (The Cave House & Woodward Park). The adventure continues: look for all kinds of wild species at Martin Park Nature Center, take an in-depth tour of Oklahoma History Center, and examine the collection at 99s Museum of Women Pilots. To find reviews, ratings, traveler tips, and more tourist information, use the Oklahoma City online tour itinerary planner . Getting from Las Vegas to Oklahoma City by flight takes about 5.5 hours. Other options: do a combination of flight and bus; or drive. The time zone difference when traveling from Las Vegas to Oklahoma City is 2 hours. Plan for slightly colder temperatures traveling from Las Vegas in August, with highs in Oklahoma City at 38°C and lows at 24°C. Finish your sightseeing early on the 11th (Tue) so you can travel to New Orleans. Discover out-of-the-way places like Clue Carre - New Orleans' First Live Escape Game and Whitney Plantation. Spend the 14th (Fri) exploring nature at Jean Lafitte National Historical Park and Preserve. And it doesn't end there: head outdoors with Ultimate Swamp Adventures, see the interesting displays at Audubon Butterfly Garden and Insectarium, explore the world behind art at The Sydney and Walda Besthoff Sculpture Garden at NOMA, and surround yourself with nature on a nature and wildlife tour. To find ratings, more things to do, reviews, and more tourist information, you can read our New Orleans online trip planner . You can fly from Oklahoma City to New Orleans in 6.5 hours. Other options are to do a combination of car and flight; or drive. Traveling from Oklahoma City in August, expect nights in New Orleans to be somewhat warmer, around 32°C, while days are little chillier, around 32°C. Finish your sightseeing early on the 14th (Fri) so you can travel to Chicago. Explore hidden gems such as Whirlpool Compass Fountain and Pontiac-Oakland Automobile Museum. Explore Chicago's surroundings by going to South Bend (Four Winds Field at Coveleski Stadium & Grotto of Our Lady Lourdes), Pontiac (Museum of the Gilding Arts & IL Route 66 Association Hall of Fame & Museum) and Racine (SC Johnson Headquarters & North Beach Park). There's more to do: immerse yourself in nature at Van Buren State Park and sample the tasty concoctions at Greenbush Brewing Company. To see maps, other places to visit, photos, and tourist information, go to the Chicago trip planner . Getting from New Orleans to Chicago by flight takes about 5 hours. Other options: drive; or take a train. Plan for a bit cooler nights when traveling from New Orleans in August since evenings lows in Chicago dip to 22°C. Wrap up your sightseeing on the 18th (Tue) early enough to travel to Boston. You'll discover tucked-away gems like Fishing Charters & Tours and Footbridge Beach. Venture out of the city with trips to George Marshall Store Gallery (in York), Fort McClary State Park (in Kittery) and MacMillan Wharf (in Provincetown). The adventure continues: admire the majestic nature at Brenton Point State Park, contemplate in the serene atmosphere at Touro Synagogue, tour the pleasant surroundings at Sachuest Beach (Second Beach), and explore and take pictures at Beavertail Lighthouse and Park. To find ratings, other places to visit, traveler tips, and other tourist information, go to the Boston day trip planner. You can fly from Chicago to Boston in 4 hours. Other options are to do a combination of flight and bus; or drive. The time zone changes from Central Standard Time (CST) to Eastern Standard Time (EST), which is usually a 1 hour difference. In August, plan for daily highs up to 32°C, and evening lows to 21°C. Wrap up your sightseeing on the 22nd (Sat) early enough to travel to New York City. Step off the beaten path and head to Ocean Grove Beach and Jenkinson's Aquarium. Get out of town with these interesting New York City side-trips: Cattus Island County Park (in Toms River), High Point State Park (in Sussex) and Delicious Orchards (in Colts Neck). There's still lots to do: admire the landmark architecture of Boscobel House and Gardens, look for gifts at Cheese on Main, and stroll through Seven Presidents Oceanfront Park. For other places to visit, where to stay, maps, and tourist information, refer to the New York City online road trip planner . Getting from Boston to New York City by combination of flight and bus takes about 3 hours. Other options: fly; or drive. Expect somewhat warmer evenings in New York City when traveling from Boston in August, with lows around 25°C. Finish your sightseeing early on the 25th (Tue) so you can travel back home.